Here are some photos of the morning speakers, the audience, our speakers and panel, and the later afternoon reception. Three towers outline St. Michael’s history from the origins of its design and key aspects in the 18th Century through changes in the 19th and key developments in the 20th. A fourth tower highlights St. Michael’s music, children, serving others and remembering our forefathers and mothers. 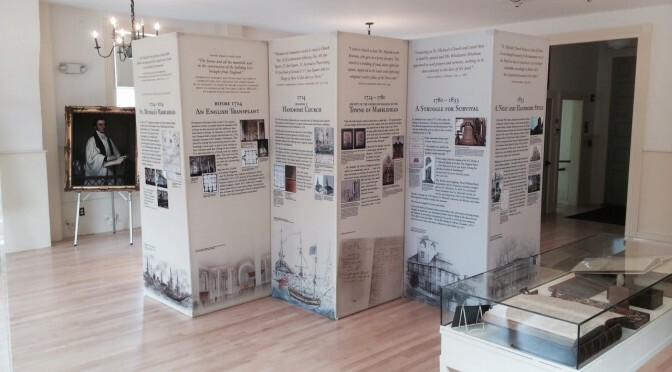 The three towers were on display at the Old Town House Memorial Day weekend with portraits, documents and related items. The towers were again displayed at the Peabody Essex Museum during the symposium while the fourth tower and various artifacts were displayed at the symposium. The fourth tower will be up for the Lobster Lunch and all four will stand together once renovations are complete. Patsy and Lia from MHTV’s “Marblehead Youth News” recently visited St. Michael’s, and Vestry member and Tercentenary Committee chair Rob Howie was kind enough to give them a tour of the church.